Is It Safe To Feed My Family GMOs? Moms want to know. Great, factual information. The science speaks loud and clear and I’m thankful for the 2000+ studies showing no harm. Our farm uses less (& less toxic) herbicides now too. That’s a good thing for our environment. Thanks Peg! We can say the same thing about using less pesticides. if people are using less spray/chemicals(which ultimately go to the water sources), then why is dow, and other chemical company’s(the ones that supply farm spray), stocks and sales SKYROCKETED ever since roundup ready seeds came about? And based on our neighbors farming practices, they are actually using more chemicals now(weeds are resistant to roundup ready and other chemical, because of the lazy farm practices now, just go out and spray it, instead of using proper crop rotation or cover crops). In a nut shell, this is farming now(not all farmers do this but its growing fast),, plant, spray twice, and wait for government checks. then harvests and put down fertilizers, aka, oil(most fertilizers are made from oil base), hire someone to do chores while they go on vacation for 3 weeks, plus in the summer time they have a lot of free time too. We farmed and I don’t remember my dad and grandpa taking more than a week vacation at a time., on regards to the s2000k plus studies, who funds those studies,, Monsanto. ,plus have you noticed in the past 15+ years, allergies and other health issues have skyrocketed, hummm,,whats the odds. We cut out GMO foods(best we can) and got organic foods now and on the farm have been organic for over 20 yrs, and wow, our allergies are gone, and we rarely get sick..whats the odds. Dear Common Sense, I can only tell you what we do on our farm. And I hear the same story from many other farmers. We do use less chemicals. And I will agree with you that farmers did become lazy when they were using round up. It worked so well farmers became complacent. I believe there is more of an awareness of herbicide resistant weeds and I do believe farmers are making changes. As far as the government checks, again, I can only tell you my opinion from where we live. I would rather not have a government check. I would rather plant and let our crops grow and sell them for more than it cost us. Unfortunately, there are times when it doesn’t work out that way. With the exception of this past year (it was dry), our area was in a three year drought. Completely out of our control. That’s why we have multi-peril insurance programs and we do pay a lot in premiums for this program. You also addressed health issues that have skyrocketed. We need to be careful of the correlation equals causation argument. We do need to keep researching to find causes of these illnesses. And I am glad organic has worked for you. We need all types of farmers. But I don’t think we should vilify conventional crops to promote organic. In fact Monsanto sued a farmer in Saskatchewan re patented canola. Monsanto won the case, and the elderly farmers lost all their retirement savings trying to defend themselves in court. My response is I feel if farmers knowingly planted patented seeds, it is equivalent to stealing and they should pay a penalty. It is my understanding that Monsanto has not sued farmers with trace amounts in their fields. If you can post a link to the farmer in Saskatchewan, I would be happy to read it and research it. If you mean Percy Schmeiser, Canadian organic canola farmer, HE won the over 7 year case against Monsanto. He was sued by Monsanto for GE Patent infringement, which he argued was due to SEED or POLLEN drift, because he had never bought GE seed. He is one of the only farmers ever to win against Monsanto in court (Canada, folks.) He now travels the world warning eaters about this. Schmeiser’s argument that the plants on his property were due to SEED and POLLEN drift was not accepted by the court because 80% of the plants sampled were found to be the round-up ready variety. He did not win the case. Only partially right. Many claim the Percy Schmeiser case is an example of Monsanto suing a farmer for trace amounts of patented genetic material entering their fields. I have read and reread several times the actual court case including the facts of the case as detailed by the actual court, not Monsanto’s nor Greenpeace’s representation of what happened. A detail left out of your narrative is that the court did not find patent infringement because his fields inadvertently contained traces of patented genes, they found patent infringement when he purposely sprayed the growing crop to eliminate non-roundup ready plants, and then saved these seeds for planting repeating the process until he had mostly roundup ready. Same with Bowman. The infringement occurred when knowing the commodity soybeans he purchased at the elevator were likely to be mostly roundup ready, planted them and then purposely eliminated the non-roundup ready plants by spraying roundup on the growing plants, saving the seed and repeating the process for eight years. It seems odd that if Percy Schmaser and Bowman felt that the roundup ready genetics “contaminated” his crop, and he really didn’t want it in his fields to begin with, that they would go to so much trouble to make sure that his entire crop contained the genetics. Also, Schmeiser did not win the case because the court did indeed find Schmeiser in violation of Monsanto’s patent. He claims it was a win because the courts did not agree to the damages Monsanto sought in the case. By the way, in the Bowman case, the elevator involved would not knowing sell stored grain to someone to use as seeds since that would be a violation of state commercial seed laws. These require grain sold as seeds to be labeled and to make certain declaration as to content and quality, such as germination rate as verified by testing, and also must meet regulations regarding foreign matter, weed seed content, etc. Thank you so much for doing that research, Rick. I have not seen where anybody else has actually read the court documents. Great information, with no hype. That’s what we need. Do you have a source link for this? I am talking about farmers not being sued for trace amounts of patented seed. If farmers intentionally planted the patented seeds, which is a direct infraction of their agreement, than yes, I am sure they will be sued. Dear Anonymous – if you feel so strongly about this issue why do you hide behind the “anonymous” moniker? This is typical tripe from someone who believes everything they read on the interweb. Do you want to know why Monsanto sues farmers? It’s because those few idiots (145 lawsuits filed since 1997) STEAL the technology Monsanto has spend billions of $$ developing. Try walking into WalMart and leaving with a box of bananas without paying for them. It’s theft, plain and simple. By the way, Monsanto has won EVERY one of those lawsuits (only 9 actually went to trial) and EVERY PENNY they’ve won they’ve donated to local charities. And the Seralini study? Really, you’re citing that?! Oops, that’s not gonna help your case. Now, am I a “fan” of Monsanto. No way. But so is every business, including the mom-and-pop hardware store on the corner and yes, even organic farmers who need to feed their families and pay their bills as well. Just because the internet now enables anti-vaxxers, anti-GMO types and those who still believe Elvis is alive to continue to share their foolish beliefs does not mean what these people are saying is truth! Don’t be sheep. Think critically. Do research. The science is in. You, Mr./Ms. Anonymous are simply wrong. Wanda, your patience with these ill-informed people is amazing. Keep up the good work! Thank you so much Bob! I love your comment “Don’t be sheep. Think critically. Do research.” That is the key. Bob, I am clapping from here! EXCELLENT response! Bob do you have any links not ran by gm companies? Hi, check out http://www.biofortified.org Not only is it a website run by academia they have a list of research done by independent 3rd party members. i take it you didn’t watch the piece on 60 minutes about Monsanto breaking down a pig’s DNA and its traits and putting a patient on them. Yes they did it, even though they didn’t develop the traits. So tell me again how Monsanto developed the traits that they want farmers to pay for ? So tell me why has Monsanto snuck through a bill designed to free them of ALL lawsuits against them for patient rights and possible wrong doing on those traits? If your not doing things illegally then why do you need protection? I don’t really understand your comment at all. Monsanto breaking down a pig’s DNA and its traits and putting a patient on them? That makes no sense to me. Thank you for your comments. You refer to the Seralini study and you do realize the publication that published the study has now rescinded the study as not a valid study. I agree that we need to look at neutral studies in regards to GMO’s. I believe there are over 200 studies done on GMO’s that have no bias. I also believe we need all types of farmers, organic and conventional, GMO and non-GMO. I just feel that moms should not feel guilty if they feed their families foods that are not organic and may contain GMO. As far as the funding of these labs, I happen to tour the Danforth Plant Science center this past summer and very little of their money comes from Monsanto. The vast majority of the money used to fund their plant science lab is government grants. I never said Round Up was harmless and I would refer to the USDA, EPA, and FDA and their studies. It is the FDA, EPA and USDA that test these seeds and approves them. I appreciate your comments and your respectfulness. Actually the FDA, USDA, and EPA do not test the GE varieties or hybrids submitted for approval. They take the data submitted by Monsanto or other seed companies seeking approval of the variety or hybrid, evaluate the data, and determine whether to approve based on that data. They may give approval, they may ask a company to submit additional data, or they may fail to approve the hybrid/variety. GMOs are considered GRAS according to the FDA. And the the fact that they are in up to 80% of our groceries including baby formula should be cause for concern. Monsanto and the like paying millions over and over again to fight our right for a label is really pretty disgusting. It’s the way they do business that is such a turn off for people. Monsanto says it’s up to the government to prove its technology is safe and the government says that’s Monsanto’s job. many science journals, blogs and various academic papers and not once have I thought WOW I really need to feed my family more of this stuff!! I appreciate you sharing what you’ve experienced on your farm. I think you are absolutely right about fear-based marketing. It is really easy to let emotions take over, especially with the variety of information available today. Thank you for providing links and citing your sources – it can be hard to distinguish fear from fact. Would you mind answering a few questions? You mention you use less pesticides and that there’s 70% less runoff. It seems that “pesticides”, “herbicides”, “insecticides”, and “chemicals” are used interchangeably. Are you only measuring pesticide usage? 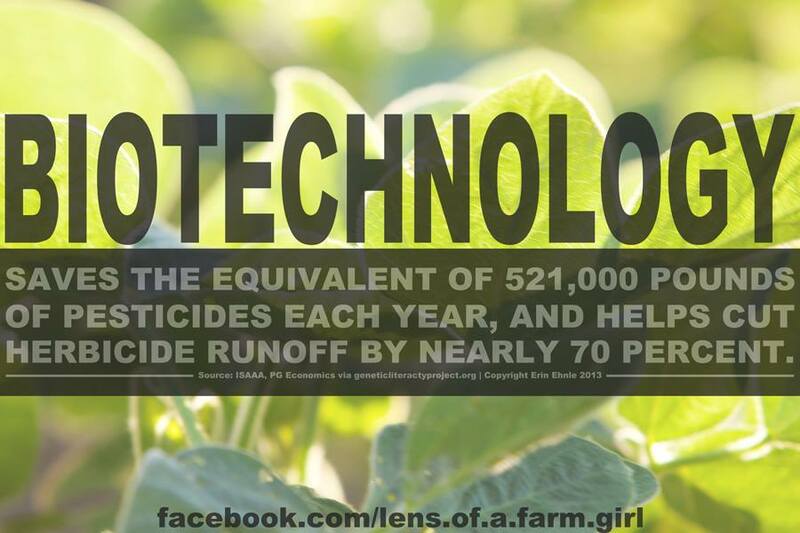 Or do you also use less herbicides / insecticides / chemicals? How do you measure the amount of runoff? You also state that there’s 90% less soil erosion – how do you measure that? How do you know there’s less soil erosion due to planting GMOs? I don’t quite understand how GMOs reduce soil erosion. Thank you again for your time. Stacy just a point of clarification, Pesticides is the broad category and it contains insecticides and herbicides. Insecticides and herbicides are a type of pesticide that farmers use, if that makes sense. Thank you for you comments and questions. When I refer to pesticides, I am referring to herbicides and insecticides. My statement about the percentages of runoff come from a report form the Council for Agricultural Science and Technology report. Here is another document from Purdue University (http://www.ctic.purdue.edu/media/pdf/BioTechFINAL%20COPY%20SEND%20TO%20PRINTER.pdf) that refers to the same information. There is less soil erosion due to GMO plants because using biotech encourages less tillage. Conservation tillage results in less soil erosion because it holds the water better. Refer to the report to get a more detailed answer. Thank you for asking questions and being respectful. Thank you for clarifying the term “pesticides”. I guess I was thinking that “pesticides” was literally used to control “pests”; not that it was a broad category. Wanda, thank you for the additional information regarding runoff and erosion. I appreciate your help! In regards to reduced run-off/erosion, I believe what Wanda probably means is since the of GMOs, there has been a drastic reduction in tillage. Non-GMOs(especially organic) require intense tillage to control weed pressure, four even six times through the field doing a tillage operation in one season. You are asking the impossible. No food has ever been verified as 100% safe, not even organic foods. Science doesn’t work that way. Anything may be found to be toxic at some level, even water. Science does not prove things, it only gathers evidence to support a hypothesis. We can test a food and show that it is AT LEAST AS SAFE AS other conventional foods, but that is all we can do. You say you have no “superweeds” or bug problems even though you farm conventionally. Good for you, and hopefully your farm will stay that way, but it requires proper use of chemicals to keep them effective, whether used with GE crops or conventional. You must know that herbicide and insecticide resistance can and does occur without the use of genetically engineered crops, right? No one honestly says Roundup is harmless, but it is much safer than many of the herbicides that it has replaced. Surely you have heard of atrazine and alachlor in ground water? But as Wanda pointed out above, 99% of the pesticides we eat are produced by the plants themselves. Wanda, great post! I am amazed by all the science on this topic and how straightforward science can be so controversial. It’s interesting how we can all find scientific studies to support our positions, regardless of what our positions are – whether you’re for, against, or on the fence for GMOs, you can find a study to support your decision. I know that I have consumed GE foods, and I’m not afraid of them, either! Those who look at the ban of GMO’s in Europe need to be checking up on recent, and not so recent happenings on that front. Last week I had a conversation with an Italian representative from the EU. He was able to list off the GMO “events” that are OK for use in the EU. Yes, not all GMO events are yet allowed, but as they complete their research more and more GMO’s are being released for use in the EU. They are being cautious, but not hysterical, about new products. It’s easy to make crazy claims from the Anonymous by line. If you truly believe what you are saying, I believe you should post your name. It is easy to be shocked at ignorance and lies if you do not exist. Thank you Wanda for your diligence in keeping up the polite conversation. I too can speak to the fact that we are using less chemicals on our farm. I have farm records to prove it. We use less fuel because we practice conservation with minimum tillage. We do less tillage because we are better able to control weed pressure with selective seed traits for our growing region. RoundUp is not a silver bullet. You need to use due diligence by using correct prescriptions recommended by agronomists who are a tool in our management practices. If a doctor recommends/prescribes a medicine for you are you going to half kill a virus/bacteria by only taking half the recommended dosage? I’ve heard that there are some who cut rate recommended chemical doses. That may be the origin of some of the super weed problems. Do people really think the generations before us were healthier because there were not the technologies we now have? In my opinion that is ignorant to think that way. if you actually read it carefully says the reason you want GM crops is so you can apply more herbicide than you can with out GM crops. pg 6 This article also talks about healthy organic soil, so take a look at most farm fields that lay fallow for 1-2 years, what growing there? What insects live there? So if the primary seed is a GM seed that is poison ready then where is the diversity of plant genetics required to reduce poison tolerant weed growth? Dear Sir: I have read all the links you provided. I most certainly disagree with your assessment that our farm will have to change our practices to the degree you see needed.. One that I will point out here is the link to Purdue.edu. and more specifically page 6 of that document. No where on that page does it say that we want GM crops so that we can use more herbicides. I would ask that you reread that PDF. Paragraph 5 says that consumers may not consider the indirect benefits to them such as lower food prices, less use of crop protection products (i.e. herbicides) and better conservation practices that protect soil, water and air resources. Take note that I have said that we practice conservation tillage on our farm as well have many other farmers have adapted to that practice. You have coined the GM seed as poison. That seems to fit your need for your beliefs. We will continue to rely on accurate and scientific information provided to us. The fear mongering that is continually thrown out there will eventually lose out to good and correct information. Well paid by Monsanto! Sorry but wild strawberries grow naturally never exposed to man in the Rockies and northern forest, so debunk on that….and the problem isn’t so much the plants and hybrid breeding, it’s the unacceptable use of chemicals you’ve made them resistant too! No different than ferrel cats! Your post almost did not get approved. I expect respect on my blog. And the last sentence was not necessary. #1 – I am not paid by Monsanto or any other company or person. In regards to the strawberries – they were never a natural plant, but rather the result of hybridization of two different species. Anonymous, that is a silly claim. Yes, strawberries do grow naturally now…the point is they didn’t at one point. It was a cross between a plant from South America and a plant from…France I believe. Learned that in my botany class 10 years ago. And I don’t understand the problem with them being resistant to ‘unacceptable’ chemicals? You want your food good and unresistable to whatever is poured on it? The strawberries were taken from different parts of the Americas. At the time strawberries were not as large as they are now and two different plants were taken to France where they were kept in a greenhouse and happened to cross pollenate thus making another type strawberry plant that produced larger strawberries. First, that was rude. Also that is a FACT about strawberries. Corn is another crop that would not be what it is today without human hybridization. Instead it would resemble the tiny colored “indian corn” decoration you see around thanksgiving. If we still grew corn like that most of the world would be going hungry. John, Thank you for your comments. I am a farmer also – we grow corn and soybeans. I must admit I disagree with many of them. First, I think it’s great that you are growing crops with no pesticides. That works for you and that is what you should be doing. We need all types of farmers! I would like you to expound on the fact that small farmers do not get subsidies. I am not sure what you are talking about. I am sorry but I am not seeing the same results from GMO’s that you are. We are not seeing the erosion problem or the poor yields. In fact, the area I live in has been in a drought for the last 3 years. And our yields have been very respectable considering how little rain we received. You make numerous claims – claims that we just don’t see on our farm. And like I said before, you should continue doing what you do because that is what works for you. And, I won’t apologize for looking at science and research to base my decisions and opinions. Thanks again, John. Again, Anonymous, I disagree with your statements and like I have stated before, I request that you be respectful and no name calling. Civil conversations only. Anonymous is from the boycott gmo group & SHE has posted your link to this there. She wrote..
Wendy, the author of this blog, refuses to debate issues she cannot prove wrong, and deletes posts when she cannot manicure an answer. Try mentioning Bt pollinator decline, Farmer suicides and dependence on Corporate products (There is no sustainable self seeding system here, you’ll have to buy seed and chemicals from this Corporation for life. GM crops will self seed, but you’ll have to report it and pay Monsanto for the privilege of their sterile seed… um reseeding), Seed extinction, Soil degradation, Pollution of water sources, Increased toxin use, Decrease in most crop yields, Increased Obesity due to Sugar Beets and Corn Syrup, Research that reports Negative results to Health (Yes, there are unbiased independent studies – people have been fired to keep this information out there), Why the Corporation Executives and many GMO farmers won’t eat the food they produce. I invite you to debate with her, fill the page with knowledge that hasn’t been snuffed out. Just be warned, she may not allow your post or delete it if she cannot prove it wrong, or agree to some part of it. And she will share a link to an ex-GMO activist who now runs a “non-profit” page (with a donate button) to promote GMOs. Guess it pays better than fighting the good fight? Are the current GMO crops even worth keeping around, let alone arguing whether or not they are safe to eat? The cons outweigh the pros in this debate, regardless. I will have to ask you to expand your explanation of “genetic engineering” because I was taught in college classes that GMOs and hybrids are completely different. Hybrids are created by crossing two plants of the same species, meaning corn crossed with corn or strawberries crossed with strawberries. This process occurs naturally in the wild and can be influenced by humans. Humans will influence the hybridization by selecting plants that exhibit specific traits whether it is higher yield, stronger stalks, or any other phenotype or physical trait they want the next generation plant to exhibit. Genetically modified organisms, as you speak of in this article, are created by gene insertion using genes from a different plant species or even a different kingdom, like bacteria to plants. So they are not created by crossing plants of the same species like the hybridization process. For example, the Bt trait developed by Monsanto is a bacterium (Bacillus thuringiensis) that is inserted into a plant. I don’t think inserting a bacteria into corn would be considered a hybrid and this process does not happen in naturally in the wild to my knowledge. In theory you could insert a gene from a salmon into a tomato that could increase the plants cold hardiness. This would be genetic engineering or a genetically modified organism. If for some reason that my explanation of how hybridization and genetically engineering are different is wrong, please inform me otherwise. Yes, I would agree with you on all points except for that it genetic modifications do happen naturally in the wild. Check this link: http://www.sciencedaily.com/releases/2010/11/101104083102.htm Thanks for your comments! This is my understanding of hybrid vs GMO. I hope the author makes time to address your question/comment. Wanda, your patience with “anonymous” is commendable. I will respectfully consider his comments to be the result of one of two things: because he is indeed a troll, or if he is truly a farmer, perhaps due to bitterness. Both situations are sad, but don’t give him the right to be disrespectful or fill this space with untrue information. One of the most inaccurate things he talked about (besides citing the debunked Seralini report) was that pigs eating GM feed are somehow adversely affected. On my farm (& most pig farms in the U.S. and overseas) we have been feeding GM corn and we know their feed conversion has improved over the years. Sick animals would not grow well. Keep up the good work and thanks for sharing good information. I completely agree with you. We raise pigs also and our pigs eat GMO corn too and like you, our pigs are very healthy and do very well. In fact we consistently receive a premium for our pigs because of their quality. I want my blog to be transparent and yet I do not want it to be used as a platform for activists. Sometimes it’s hard to know who the commenters are-if they actually believe what they are saying are or if they are activists. And I probably give this person the benefit of the doubt. Thanks you for your comments. we stopped feeding our cattle and pig gmo’s for one reason, they started to get sick and poor bone structure, which led to them not gaining. We had to increase the use of implants and shots 3x’s more than previous feed source. When we went back to NON GMO’s feed source, we saw drastic improvement on health and less need for shots and we got rid of the implants. Plus we know what is happening to our water sources because of Round up. We did our OWN test on water quality on our land prior to going organic and sent the test to the state U. and we had a drastic wake up call. We did some drastic changes and went organic(saved money also). and after 4 yrs, just the water run off from our land alone, was way way better quality than when we farmed with round up. Round up ready is a ticking time disaster waiting to explode. I really hate to say it, but science don’t lie. These were our studys, not a study funded by Monsanto either. Interesting. We have pigs on our farm and we feed our GMO corn to them. For over 20 years. And we do not have any problems with our pigs eating our corn. And this is our study. if you would go back to NON GMO, I think you will notice a huge difference, from sickness and better gains. At least we did. Plus we prefer clean water. Our death loss is low. Gains are great. We don’t see any adverse effects from using GMOs. Great article to share with the lay person! Monsanto has sued over their seeds. Here is one that went to the supreme court of Canada. Is this suite from trace amounts of their patented seed or is it intentionally using patented seeds? Deleting posts you cannot rebut? Nice way to back your manicured blog post. Trim the opposing information. . . I am not going to allow my blog to be a platform for the anti-GMO activist. Why group someone making debate on your blog as an activist? I thought blogs were for the greater good. This should be a place we all can share our knowledge and different backgrounds peacefully. I still don’t agree with your article but I am here to learn more about why people feel that they are ok. 🙂 I have friends and family that are farming on both sides but I still love them all the same. I am with you Sheila. I love conversation. The activists I am talking about are ones who use inflammatory language, insulting, rude and who will not participate in a civil conversation. My blog is not a place for their platform. But honest conversation and questions are welcome. The one thing that I take issue with is that you seem to equate cross-breeding with genetic engineering. Nothing could be farther from the truth. Cross-breeding only causes the changes that nature would allow. Genetic engineering using viruses to inject fragments into the DNA of a plant is not even close to the same thing. My biggest issue with GE food is the idea that we think we can improve on what God created for us. Seems pretty blasphemous to me, which I realize won’t be everyone’s perspective due to varying religious beliefs. Cross-breeding is more recombining what God has given us, whereas genetic engineering is messing with the building blocks of life where we can’t possibly understand all of the implications given that we don’t understand fully the DNA molecule. I’m not saying that GE food is evil in concept, I’m just concerned that if in the future it is found to have negative effects, by then due to cross-pollination we may not have any plants left that remain as originally created. I hear what you are saying. And I do make a distinction between genetic engineering and cross-breeding. Genetic modifications do happen in nature. Ken, there are massive “food banks”, if you will, around the country where they store the majority of strains both past and present of our crops. This is done to prevent just that- not having any originals left after all this modification. Odd that you say strawberries never existed in nature. I found many references to the fact that they grew wild in forests before ever being cultivated. Here is one such site. http://www.berries4u.com/history.htm I do wonder about the validity of your other statements as I am not a “sheep” and do not usually go with the current trends in “fear mongering.” However, I HAVE done a lot of research on my own about Monsanto and GMO’s curious to what all the hoopla was about. I have to say, I have learned a few scary things off AND on anti Monsanto type sites. I think nobody will know for sure what, if any, affects GMO products may to to humans, until several years from now. However, personally, I would love to have the opportunity to make the decisions on whether to use GMO products or not. However, it seems Monsanto fights at every opportunity to label their products. This in and of itself, at least to me, is suspicious. Probably the biggest issue with labeling is when something is labeled it signifies a warning that something maybe harmful. And with no evidence of harm with GMO’s, it seems there is no point in it. And with anti-GMO activists going state by state, it makes it difficult for food companies to comply with a potential 50 different laws to comply with. It probably would be better handled on a federal level. You are a little off on Monsanto, they have went after ten farmers in Indiana who supposedly planted beans that had the roundup ready gene in them, due to cross contamination, from a neighbors field, and even though they did not use glyphosphate on them, they were grown for a plowdown and livestock feed, Monsanto still sued them. cost him his farm. It happens. Do you have a link or reference to this? Folks need to hear from more FARMERS. I am tired of reading the comments of urbanites, that think they know what farmers do. I have never lived in the country, but at least I have the sense to go to talk them about farming, just like I ask a computer professional about computer issues. I am not going to eat it! That’s definitely your option but just know where science is on the issue. Natural resource science as well as nutritionists have done studies… you can look them up. I went for Agronomy Science and Natural Resource Science and yes love gardening and raising honeybees (which GMO is killing off and has been scientifically proven here in MN)!!! Do you have a source for your bee killing claim? I just read an article about bee death likely being related to Tobacco Ringspot Virus by American Academy of Microbiology. No it is not our option anymore, unless you grow your own. Big corporations are taking over our food supply. If you choose to eat GMO’s so be it, but for those of us who wish not too, labeling of GMO’s would be a good thing. If everyone is so on board with genetically modified foods why are these big corporations so against having to label their products. I try to be open minded about the subject of GM foods. Are they all bad? Maybe not, but for me the verdict is not in. I do know that I am not interested in eating corn with a built in pesticide. Pretty certain our bee pollution is not too keen on it as well. Have you tried to purchase anything off the grocery shelf that does not contain some sort of corn product? It is pretty difficult. However I do want to respectful of you opinion. You say growing seed with a pesticide already built in is a good thing for your husband because he then is not endangered by having to spray the chemical himself which is good for him. I will definitely agree with that, but I really prefer not to eat any pesticide whether it be sprayed manually or otherwise. ( We do grow our own very successfully without chemicals ). Not everyone is so fortunate as to be able to do so. Big companies have taken over most of our food and we just can not trust them to have our best interest at heart. The folks that can control the food supply can pretty much control anything they want wouldn’t you say? So please let’s don’t be sheep or cattle and do keep up the fight to maintain control of our food supply and the safety of that supply as well. We need to get our heads out of the sand and pay attention to what is going on! Here is a (crazy) thought: What if we labeled foods that do NOT contain GMOs? Then since that is what some seem to be looking for, they can find that. Seems like many feel there are GMOs in most foods so it would be easier to label the NON-GMO products, then these products can fetch a premium if you will, actually now that I read it out loud I am talking about organic products. Can we differentiate Non-GMO vs organic? or are they one and the same? I hope this weather turns around, too many deep thoughts! We do have a 3rd party verification; http://www.nongmoproject.org. The Non-GMO Project is a non-profit organization committed to preserving and building the non-GMO food supply, educating consumers, and providing verified non-GMO choices. We believe that everyone deserves an informed choice about whether or not to consume genetically modified organisms. Depending on which clock you view the net population growth for today January 23, 2014 will be over an additional 100,000 individuals to feed. The challenge do to this is with less land, less water, and less resources. Unfortunately as we all have seen and know there are people on this plant today that will not have access to food and the population continues to grow and the challenge goes on. Thank you for your comments. Feeding people is the basis of any discussion in regards to food. Wanda, There are a few things you don’t address, and I’d be curious to hear your thoughts on these. You don’t address is that GMO crops are best suited for large, monocrop fields, which results in much less biodiversity across the globe. There’s been a lot of talk about the effects of pesticides and monocropping on bee populations or on populations of Monarch butterflies. We have a real crisis, and GMO exacerbates the problem. I’m not going to grow a tumor if I eat GMO corn (though, how often do I eat unprocessed corn? ), but the bio diversity of our country and our world is seriously negatively effected by the current agricultural system. Another point of that article is that Monsanto has an extremely complex public relations system that, I feel (and maybe you disagree), provides misinformation in order to secure the companies profits instead of sincerely helping family farms. I think of interviews I’ve heard from the owners of seed companies who signed the safe seed pledge (I’m thinking of Tom Stearns of High Mowing seeds or Jere Gettle of Baker Creek), and they’re sincerely working to help family farms and home gardeners to provide for themselves instead of merely depending on the company for seeds. I think that the fact that you go to monsanto’s site for information on “monsanto myths” is dangerous. They’re interested in making money off the backs of farmers instead of helping farmers. I’m not trying to say Monsanto is evil, though a lot of people do. I think that they’re a product of the system we have, which is broken. And the work that they are doing is making things worse. The number of farmers has severely decreased in recent years through bankruptcy or for other reasons. There are more and more hungry people in the world even though we’re producing (and selling and transporting) supposedly record amounts of “staples” (again, I don’t really eat soybeans that often…). Also, the people who ARE getting the food are having increased amounts of health issues. Again, this isn’t a direct result of GMO. The problems we face are very complex. But the GMO issue is one that complicates the problems even more, especially the amount of money that these companies are giving to our politicians who are supposed to have OUR interests in mind. Anyway, I believe I was respectful, and I’m sincerely interested in hearing your respectful response! Thanks. Perfectly put!!! The honybee issue sits here at home for us in central MN!!! The bee larva die from the adults drinking the water in the corn stalk after it has been sprayed. And we NEED bees! You were very respectful and I thank you for that. You make some interesting points, which to be honest, I need to think about before responding. My perspective is one from a farmer. GMO’s allows us to use less pesticides which is good for us personally and for the environment. Granted these benefits are mostly for farmers and not so much about the consumer. When you talk about monocrops, we do rotate crops between corn and soybeans. Something we have done for the past 35 years. I also think we need to be careful that we distinguish correlation statements and causation statements. And I do agree with your statement about bees and monarch butterflies that we need to find out what is happening to them. Like I said, you make some interesting points that I will ponder. Thank you! Excellent explanation. It’s so hard to defend GE/GMO when one is not familiar with the science. I’m saving your article for future reference. My husband works for Monsanto, and I’m not ashamed of that. I don’t appreciate people who associate 100% negativity with Monsanto. No company is perfect, but it is absolutely false that Monsanto creates technology or products that harm people. These type issues have taught me to do my own investigative work before jumping on a bandwagon that is based on false information and gossip. Thanks for this accurate report. A terrific article, I attended the voice of agriculture conference in Michigan today andCathy Enright from the council of biotechnology had many of the same points! Thanks so much for being a voice for all of us. For those of you still questioning the gmo “world” check out a website http://www.gmoanswers.com it has a bunch of questions and answers completed by people living in the real world not Monsanto but scientists, farmers and others, it also has their picture and name associated with the answer. They have stuck their faces and names out there for a business and industry they believe in. That’s good to know, thanks for the link! If these farmers intentionally held back patented seed for their own use, when it is illegal to do so, they should pay a penalty. I am defending doing the right thing. It doesn’t matter who the company is. Or their crops of conventional seed were cross pollinated with surrounding crops of Monsanto plants. The produced seed therefore became “patented property”. Perhaps farmer’s should sue Monsanto for rendering their seed useless. Every one of these comments is by “anonymous” and not a single one has a source for their claims. I would really like to learn more about their claims. Thanks Dan. I have changed my blog setup now so people cannot leave an anonymous comment. I agree with needing references and sources to claims. Agent Orange was created for the U.S. military at the request of the U.S. military. Monsanto and Dupont had no choice in the matter. When chemical agents are sprayed “Off Label” as Agent Orange was, there are going to be consequences. It was the military who applied the Agent Orange where it could cause problems for our fighting men that are to blame, not the makers of the chemical agent. F. Moustaki, like Wanda, I appreciate your respectful way of writing and the complex issues you point out. Regarding your comment, “the number of farmers has severely decreased in recent years through bankruptcy or for other reasons.” I am a farmer and ag loan officer in southwest Minnesota, and I can speak to the financial status of farmers in this area. I cannot speak to the financial status of farmers in other parts of Minnesota, the United States, or other countries. In our area, not one farmer has gone bankrupt in recent years. In the ag crisis of the 1980s, yes, farmers did go broke and some lost their farms. I also wanted to share that on our farm, we rotate corn and soybeans. We have NEVER planted 100% corn or 100% soybeans – we plant roughly half our fields to corn and half to soybeans, and we rotate those fields every year (fields that were corn last year will be soybeans this year). We also practice conservation tillage. When I drive the 13 miles from our farm to the nearest town, I see not only fields of corn and soybeans, but also hay fields, alfalfa fields, pastures, trees, ponds, and grasses. I understand that southwest Minnesota does not have as much ecological diversity as the rainforest, but I do not believe that our area has turned into a monoculture. I agree with you; I don’t believe Monsanto is evil. Monsanto employs thousands of people, and I believe that each of them, like me, is trying to provide for their families. I find it hard to believe that all of those thousands of people are intentionally trying to cause harm to farmers, consumers, and the environment, or that they think the work they do makes things worse. I would venture a guess that many of the employees who work with biotechnology truly believe they are trying to make things better. I’m not saying Monsanto is the best company on earth; I’m just saying that I think Monsanto, like any other company, has pros and cons. I realize I don’t address all of your comments. I don’t feel prepared to address all of them; there were just a few things that came to mind when I read your post and I wanted to respond. Thank you again for your thoughtful and respectful comments. I hope that my comments are equally as thoughtful and respectful. Even if you rotate your corn and beans. It is still referred to a monoculture because that is all that is grown. You are blessed to be in a part of Minnesota that has trees, grasses, hay fields, etc. Many places for example like Western Iowa has few trees, minute bits of grass and hay fields, etc. A huge majority of farmers have no livestock, so there is no need for anything but corn and beans. We are very limited in finding oats, oat straw, hay, grass bales, etc. Every year, we loose more of our pastures to corn/soybean rotations. Even the CRP has been mostly ripped up for planting. We live in a monoculture because for as far as the eye can see and the car can drive on one tank of gas is corn and soybeans. Much different then it was 40 years ago, when one farm had pastures, hay fields, oats, maybe some barley and wheat, cows, pigs, chickens, corn, maybe soybeans, etc. I can not find one study that supports GMOs that does not ultimately end up being financed by big Ag or by the drug companies. It might not be a direct contribution, but it ends up being someone tied to one these industries. Even all the testing listed on this post ultimately ends up this way. I really want to see a study on GMOs that is not funded by someone who can make money off of it or lose their job for not having the study go the right way. Every one wants everything based on science. But what is truth in science? It all depends on so many variables. Science is theories built on theories. Where does that lead us? To propaganda? What is propaganda? It is persuading and saying what you want others to believe. We all promote some type of propaganda. We all believe in something whether it be the truth or not. It is finding the truth that is important instead of accusing each other. Those that farm with GMOs and pesticides are bias. Those who buy organic, non GMOs are bias. We are all going to see what we want to see unless we are going to take the time to research it out ourselves and in way that allows to be open to what ever the truth takes us. For many fear will prevent them in seeing the truth. Do I have the full truth? I like to think I do, but know I do not. None of us does. But where does my opinion lay with GMOs? I have chosen not to eat, grow, or participate in anything that has to do with GMOs. That does not mean I hate anyone that does. I love my father who has always been a conventional farmer. He respects my stance. I respect him as the man who taught everything I needed to know. He is a good man. Would he be open to looking into a different view of GMOs? No. But I have had different experiences that had open doors in the conventional farming world that I would have never opened previously. I have researched both sides and I have chosen what I see as the truth. The one thing that keeps me the most from GMO is “loving your neighbor as yourself”. I would never harm myself. From my research, there is to many things with a question mark with GMOs for me to be at peace in using them. Thank you for your respectful comments. I hope that Kristie also responds. I have a couple links I would like you to checkout. Here is the first: http://gmopundit.blogspot.com/p/450-published-safety-assessments.html and I would also ask you to check out http://www.biofortified.org/genera/guide/ for a list of studies done and who funded them. These studies are financed by the companies who produce them because our government requires them to produce them. Our countries regulatory agencies do not have enough money to produce the science needed, Companies like Monsanto, Dupont and Bayer do. It is impossible to produce these studies without some very costly machinery and some very educated people whom these companies can afford to pay. Not all of them. There are about 200+ independent studies. You can search for them at http://www.biofortified.org. There have absolutely been many cases of Monsanto suing over “trace” amounts or “contamination” in the fields. I’ve personally been involved in two suits: one in Fessenden, ND and Rio Grande do Sul, Brazil. They were both different cases but in Brazil the suit involved hundreds of farmers who were using pirated seeds from Argentina without knowing it, or wanting to use them. So, they actually sued Monsanto to get their royalties back. The danger is not only that GMOs are stripping away many other varieties of crops that are badly needed for climate and pest adaptation, but their construction and ownership is tailored for large-scale industrial agriculture which is not necessarily concerned with producing food crops. On the other hand, agroecology is a production system that uses no chemical pesticides, supports the local adaptation of crop varieties and produces more food per acre than industrial, GMO agriculture: http://pratoslimpos.org.br/wp-content/uploads/2012/05/SOCLA-Rio+20-scaling-up.pdf. Eat all the GMOs you want, I don’t think too many people are worried about getting sick. But, the standardization of agriculture is scary, we don’t need to look further than the potato famine to see what happens when we push one variety of crop for the whole population. There is no apostrophe in GMOs. Wild strawberries exist. There are thousands of crops that could be used as an example where the wild-type versions are inedible; strawberries are not one of these. Your reference to strawberries has no reference itself. It is probably one of the worst examples to use… one could name practically any other crop and be correct to say the uncultivated, natural ancestors are inedible (or at least not very good). In any case, it is fairly difficult to make people question their irrational beliefs. Often, people only arrive at the conclusion that they held onto fantasies about things like biotech food after they have begun questioning the remainder of their own beliefs. I am only allowing this post to be viewable because you have many inaccuracies in your claims. First, it is acceptable (maybe not perfect) in our language to use an apostrophe with acronyms. Please do your research on strawberries and I don’t think I made any claim that said they were not edible. And your last comment, I will just say the issue with GMO’s is about science and research. Not irrational beliefs or fantasies. I agree this is true, but I also think the decision to allow GMO food into the US food supply was also political. I don’t think genetic engineering itself is bad. Just like in any type of engineering it could be used in ways that are beneficial to society but it could also be used in ways that are harmful. In this case the genetic engineering being done here is not to make the food more nutritious. It is being done so companies can sell more herb-acide and so also so they can profit from the patents they receive. I personally believe the evidence is not clear either way on what is the long term impact to human health. The study that will provide the right data is being done on the entire US population right now. Maybe in 20 years we will know the real impact of this. I don’t trust their motivation and personally do not want to consume GMO food until it is proven safe over a long period of time. I support GMO labeling because consumers should be able to decide for themselves what they think is safe . Thank you for your comments. I don’t agree with your statement that GE is done some companies can sell more herbicide. I am a farmer and I can tell you we spend less on herbicides than we ever have. And probably some of the more important benefits of GE for consumers is the golden rice. Children from poverty areas around the world go blind because they don’t have enough Vitamin A. Golden rice, food derived from GE, is genetically altered to provide Vitamin A for them. This is a great example of what GE can do. Can you imagine alleviating the peanut allergens? This is possible with GE. Interesting discussion here. My biggest problem with GMO is that there has been a concerted industry effort to block any labeling of gmo in the food we eat. This makes it impossible for the consumer to choose what they eat, inducing fear and mistrust. If GMO is safe to eat, why is industry against labeling? Good question John. The issue with labeling is the impression it gives that there is something wrong. Since there is no evidence of any ill effects from GE there is no reason to label. If people do not want to eat GE they can eat organic or grow their own food. So…by this argument why don’ we just label Rice as Rice….since there is no inherent difference to let the customer decide that WHITE rice is not as healthy as BROWN rice. I don’t consider that dangerous. If educated decisions are dangerous what does that imply? I think when we get to the mindset that information is dangerous, so, instead of knowing what is or is not (harmful or not) in our food, is a sad state of affair. Who are we protecting to not give out this information? The public? Do you think, that letting people make informed decisions, based on provided and correct information is detrimental? If we have total transparency in what we are ingesting, would this not help people decide for themselves what they chose to do? Without labeling, the choice is no longer ours. To say we should not label because of the impression it may give does a great disservice to intelligent people at large and a greater service to the companies who produce the foods we are refusing to label. You may delete this post as you have on another post I did regarding labeling. However, I am being very respectful and trying to state a different point of view. I do hear what you are saying and you pose a good argument for labeling. I will also say that it is my opinion that you are in the very top percentage of people that would take the time and effort to make these decisions. Unfortunately, the vast majority of people do not and will not take the time to learn about this issue. They will immediately see the label, read something on the Internet about GMOs being awful and they will automatically assume GMOs are the cause of every health issue known to man. (ok, maybe a little exaggeration) So my question to you, how do we get consumers (all types) to take the time and effort to learn? And right now, if consumers want to know what they are eating, they really have the information right now. They would know only 8 foods have been approved for genetic engineering and they would know if they buy organic, they are avoiding GMOs. I truly believe the labeling movement is more about anti-GMO than labeling. It’s just a backdoor way into anti-GMO. And thank you for being respectful. That’s a very good point wpatsche, and there doesn’t seem to be a good answer for consumer education. I found a website called howdoesitgrow.org; it’s just getting started but its aim seems to be trying to connect the consumer to the producer. I hear your concerns about the testing of the safety of GMO’s. The report that you are referring is short on references to back their claims. I also feel it is written from a very biased view. We all are concerned about the safety of our food. And I don’t think there will be any shortage of testing all foods for safety anytime soon. Ike, I have watched the Minnesota Bound series. And, yes, our plants do take nitrogens out of the ground because it’s plant food. But we also replace the nutrients in the soil. And we watch it very carefully by testing our soils on a regular basis. As far as the Minnesota Bound series, they would love nothing more than to convert much of our land back to prairie for wildlife. Unfortunately, that is not feasible as we have people to feed. But I do think we can find a balance between the two interests. Thank you for your comment. if Monsatans seeds are beneficial they should have no trouble labelling them as such. And if they are so good for the world why are hundreds of thousands of people resisting and countries banning them outright? Deb, I did read your referenced link. The problem is this link is very biased. There is a segment in the publication that references feeding pigs GMO feed. I am a hog farmer and our pigs eat GMO corn. Our pigs do very well. We have absolutely no problems with them eating the corn. In fact, we receive a premium for our pigs because of meat quality. And countries are not outright banning biotech, but rather, have not approved them. There is only one country that has outright banned them. I hear and understand your concerns but please research both sides of the issue. Thank you. Genetic engineering is not the same thing as natural selection. Farmers have been selecting and cross pollinating since the beginning of time, but have not been introducing DNA in the manner that engineering is done today. Excellent point about plants making their own insecticides, by the way. Not only did plants evolve chemical means to avoid predation, they also have physical means i.e. thorns. GMOs are a touchy subject. I find it difficult to believe that scientists can say for certain that modifying genetics is a safe practice. Scientists didn’t even fully understand DNA until about 60 years ago(Watson and Crick), and if they have such a firm grasp on genetics, why do illnesses such as Down Syndrome still occur? That being said, I find equally difficult to believe that solely GM food would be the culprit of any sort of illness. Lifestyle plays a big role; lots of fast food and minimal exercise might be something to change before attacking GM food. It is interesting to note that General Mills were against labeling but now claim to be GM free in their Cheerios, something that doesn’t really come from a GM plant in the first place. Like you said, lots of marketing ploys. My only problem is with the USDA/Monsanto revolving door. It introduces bias and takes away credibility. I am a former USDA employee. My former boss worked for Monsanto, then the USDA. When hired, employees sign a “bribe card”. That’s it. In my office, I saw very little supervision in that respect. So the USDA can say whatever they want… but knowing that they hire people with conflicting interests makes them less credible, in my opinion. The Seralini study has been retracted by the publisher who originally published the study because it is a flawed study. These rats are bred to develop tumors. I’ve read that this is the same strain of rat that Monsanto used?? I don’t know if you are still replying to comments, but I was wondering if you had any more info on other countries banning GMOs – I thought this was a myth, that rather foods made with GMOs are not banned but required to be labeled. Can you clarify? Thanks! Some countries have not approved GMO so that is different than banning. I believe Europe labels GMO. But many of these countries that have not approved them do feed their livestock with imported corn that may contain GMO. I believe there is just one country that has outright banned their farmers from growing GMO. If you want references to this info let me know. We need all farmers to feed the growing population. However for a small farm especially a start up, needs to get a premium price for the food they grow. That is where marketing comes in and organic labels or GMO free helps a start up farm or in some cases a conventional farm in financial trouble make it in a very volatile industry. It is too bad that it has to be like this because there are benefits to GMO and new farmers for the future of agriculture we need both to feed the coming population. You can feed your children GMO food products, but the honey bees which are the worlds best pollinators are killed by GMO plants that have insecticide in them. Without honey bees whixh are in danger there will not be enough food to feed the people of this big wide world. Yes I believe we need to investigate the bee death rate. But first we need to determine what is killing them. Last I heard the jury is still out on the cause of death. Just want to say kudos to all of the individuals who have educated themselves via credible sources (unlike the above) and have chosen to take responsibility to protect their families. While it takes time and effort to prioritize health, it is well worth it, beyond measure. Individuals who rely on the govt. to do so will be sadly disappointed in the end. For those still learning… please realize that it is crystal clear that GMOs are highly questionable, as gastric, autoimmune, cancer, food allergies, autism, ADHD, gluten intolerance, anemia, and a host of other diseases have skyrocketed ever since their introduction. I know this all too well. It’s also a fact that our FDA is in bed with the bio-tech and pharma companies; they care only about the bottom line, not our well-being. Even at bare minimum, GMOs have NOT been proven SAFE, which is more than enough reason to not risk our health for, and more importantly, the health of our children. Common sense: Why replace foods you know are natural and healthy with the unknown?… for what good reason? Google “GMO health risks”. Watch the many credible documentaries available on Netflix and/or Youtube… Seeds of Death, Genetic Roulette, Food Matters, Food Inc, The World According to Monsanto, etc… an excellent list to start with can be found here: http://gmo-awareness.com/resources/movies-to-watch-gmo-and-more/ Vote with your dollar; it is the most meaningful vote you can cast. Share this info with your loved ones. Don’t get lost in the propaganda. Remember– in the end, it is survival of the fittest. Knowledge is power, but only if you use it. You won’t be sorry. I couldn’t agree more. I do want to thank Wanda for a her blog. I don’t agree with it, but we are all in this together. Even if gmos were “safe” for humans. If the Bees die , We die. My point is that you need to get the whole picture . You may think inter-changing a gene here and there is all safe and dandy. But you would have to be naive to believe that there won’t be any unforeseen side effects. And people will keep believing what they want to believe. Your scientists may just not live up to their and names and your faith in them. Erich, I agree that we need to find out what is happening to our bee population. I believe the jury is still out and is probably the result of multiple issues. I have also read that their food supply such as milkweed is dwindling. I guess we could all plant some milkweed in our gardens to help them out. Those scientists may just not live up to their names and your blind faith in them. I don’t disagree that we need to remain vigilant on the research–something science has always done and will continue to do. Also we should be concerned about their affects on the environment as well. Which this does not even touch upon. Because we live where our farms are Erich, we are concerned about the environment. We breathe the air and drink the water. We are land stewards making sure we apply the correct amount of fertilizer (manure) on the cropland. The manure is stored in concrete pits. This is a pretty lame response to a very serious question. We already know that genetically engineered plants have crossed with weeds and other plants have evolved to survive copious amounts of spraying of Round Up (which is increasingly implicated in human health issues) – we already know that GE crops INCREASE the amount pesticides being sprayed because of the ever increasing resistance to it (in fact that is why components of the more lethal 2 4 D is being touted as the next generation). There is not one shred of evidence that GE crops are safe over a 20 year study, which should be the very MINIMUM for food crops being fed on a massive scale. We have seen every single reason to grow GE crops go down in flames in the face of genuine research. The only reason to grow GE crops is to make money for a few already very rich men. GE crops are a cruel hoax. I really have to disagree with basically everything you say. I am a farmer and we have not increased the amount of pesticides sprayed. There is a reason weeds are called weeds. It is their job to change. If they don’t change to resist pesticides, the weeds would be extinct. GE crops are safe. There is absolutely no substantiated evidence they have caused any damage. We appreciate GE crops because the last 3 years we have been in a drought. With the GE seeds, our plants have tolerated the drought conditions much better than conventional seeds. That results in a more stable food supply which is good. David King, I could not agree with you more! I have seen many farmers in my area lose part of their crop to flooding and many just not plant a good portion of their land because the government is going to pay them anyway. The use of all of these chemicals is going to have a serious negative effect on our future. This is outrageous! How often has medications that were once found safe, and created by science, later been found to cause more harm than good? I recently took a friend, with a broken rib, to the doctor. The doctor prescribed a pain medication that was different from the first pain medication that was prescribed in the ER. The doctor said of the first medication, “We are finding that we are causing liver failure in patients by prescribing the other medication to often.” Weird, this medication was originally found safe by our “trusted” government agencies. Other countries are finding that by feeding their animals, specifically hogs and cattle, grass and organic feed they are using far less medication in their barns. You cannot say, without a doubt, that these scientifically created seeds, pesticides, and herbicides are not creating – or contributing – to massive health problems in this country. Farmers are being forced to use more pesticides and herbicides then ever due to super bugs created by the original implanted herbicides and pesticides that are scientifically created. Greed is controlling this country in every aspect. Science is a wonderful thing, but when it is linked to disease and mutation like Monsanto’s Agent Orange chemicals there is a serious problem. There is no proof that this new chemical will not create massive problems, nor is there proof that it will – except for three generations of Vietnamese people still being born with deformities. I personally am not agreeing to be part of this massive experiment. I do not have enough land to grow all that I need, but will not purchase products that are chocked full of chemicals. Kelly, I do hear your concerns. I can tell that farmers are not being forced to use more pesticides. In fact, on our farm, we use less. Super bugs have nothing to do with pesticides or herbicides. And with all the research (average of 13 years before a GMO seed makes it market) there is absolutely no peer review studies that show any harmful effects. There is no benefit for anyone to use more pesticides than we actually need. Monsanto owns the FDA and Obama made it happen by appointing Micheal Taylor. So sorry for being a Democrat and voting for false hope. GE food is not safe or sustainable. It is a business and they will do anything to keep you in the dark. WAKE UP! The science just is not there to backup your claims. I was hoping this was a satire, but I see it is not. How sad for you & your delusions. I am sorry that you feel that way. As a farmer who uses GMOs we don’t see any of the negative effects that run rampant on the internet. And I don’t see any credible, peer reviewed science based studies to support the negative claims. As a mom and grandma, I want the same thing any mom or grandma wants and that is to feed my family safe and healthy food. There is so much promise with the technology to improve our health. Imagine peanuts with no allergens. Imagine canola oil with omega 3 fats to help heart disease. Imagine rice with Vitamin A to help prevent child blindness in developing countries. And the list goes on. In an already nutritionally deficient nation. That’s what every starving third world nation needs is to vomit more. People preach the BioCorp seed because of production and how we can feed starving nations…America throws away so much food~production isn’t the problem…its access! I don’t believe farmers are the issue here~most family farms put their blood, sweat and tears into their crops… The problem is the BioCorps! It doesn’t help when previous employees of Monsanto etc reside on our Governing Boards! I would also like to mention the testing phase… The required 90 days of testing is such a short amount of time to prove anything…longevity is the point non GMO protesters have issue with! There have been a few long term studies done in which tumor growth was present in GMO fed rats! I can go on… The point is there needs to be long term testing which is difficult with new varieties being created yearly as well as the issue of labeling! In a world where farmers could harvest their seeds for sustainable crops~BioCorps are making that impossible! Haiti refused such seeds when the country needed it most for that simple reason~who wants a product that equals death at the end of its cycle…they are worse than a credit card with a 100 percent interest rate! If gmo’s are not dangerous or immoral in anyway why is it such an issue to label it. I’m all about pro GMO eating gmo…go for it! I however, do not want to have to question whether or not a round up soaked seeds topped with other weed resistant herbicides and pesticides are in my food! If Organic has to prove and be certified w label for proof so should BioCorp products! Period! Round Up is not soaked up in the seeds. And to be honest, we consume significantly more pesticides produced by plants than we do man applied pesticides. And organic do use pesticides. So, I can’t help but wonder how many people, who tell us NOT to listen to the scientists on the subject of global warming (because they are financially benefited), believe we SHOULD listen to the scientists who endorse GMOs (And, certainly these scientists must not be affiliated in any way with the food industry). Does anyone know what percentage of scientists agree that GMOs are safe? Funny how we believe the things that benefit us the most but ignore the “inconvenient truths”. I use a site called http://www.biofortified.org It is a volunteer run site that lists all research studies done on GMOs. They include independent studies. Also, it’s not just a site that lists only GMO research that is positive. Funny, not one mention of how GE crops are designed to withstand heavy spraying of glyphosate. I’m referring to the roundup-ready varieties. You can feed your kids whatever you want, but I am not comfortable feeding mine herbicide. And that doesn’t make me afraid of science, or living in fear. Yes we use glyphosate but to use the word “heavy spraying”is a bit of an exaggeration. On our farm, we spray once when the plants are small. Once the plants start growing they naturally crowd out many of the weeds naturally. And I can also say that roundup is much less toxic than what we used before. We have been using roundup for 20+ years. We live out here so it doesn’t make sense for us to poison our environment. The article is all hot air. All independent studies that went over 6 months (not a terribly long time) showed increased manisfestations of serious diseases. The studies done by Monsanto and other were for only 90 days and the symptoms that did crop up were written off as insignificant. Can you send me some links of those studies? Well, no matter what you say, I do not want to ever eat any GMO organism. If you don’t think its bad, remember what they said about agent orange? About DDT? About high fruitcose corn syrup? About cigarettes even? The big chem companies lie, the truth comes out years later. More and more truths come out way after its too late. Thank you for your comment Cindy. And I hear what you are saying and I understand your concern. I do think the GMO technology is a little different as it’s not a “thing (like you examples),” but rather a process. The same process that we use to make insulin. It takes about 10-13 years to bring a GMO from idea to market and the FDA, EPA and USDA test and must approve the GMO. GMOs are only one tool in a farmers tool box but it does allow us to use fewer pesticides which is good for us and the environment. I think the real problem that people worry about with gmo foods is that when the plants DNA is changed that is what causes people problems. Ive read the research that has shown that gmo foods nucleic acids, which is the plants DNA, get taken up by the gut flora in humans. Which is something common with all bacteria and their ability to take up foreign DNA. But when bacteria take up foreign nucleic acids it becomes a part of their functional DNA. So if the DNA code is to make some toxic chemical, such as a plant pesticide that’s more potent then that’s what the gut flora will then produce. And that added extra pesticide being made in the gut all the time can cause health problems in time. Just do some research on how bacteria tend to take up foreign DNA. Science now uses transfection, “a method to impose DNA into bacteria” all the time now to get bacteria to produce many chemicals or proteins they want it to make. There are many ways to use transfection for adding foreign DNA into bacteria, but it also happens naturally in the gut when gut flora come across foreign nucleic acids from foods we eat. Some of the worries you bring up are very valid. The concept that you are referring to is called horizontal gene transfer. Many studies have been conducted to investigate the potential of this occurring in animal models, and the consensus has been that this is extremely unlikely to happen with deleterious consequences. Toxins, like Bt toxin produced by some genetically engineered plants, is made of proteins. Proteins are made of little building blocks called amino acids. Amino acids sequences are determined by the sequence of DNA.. Hence, if a DNA sequence is incomplete, the protein cannot be made properly. In diseases like sickle cell anemia, a single amino acid change can make a protein non functional. Now, back to the risk of DNA transfer. First of all, there are many obstacles preventing this sort of transfer from happening in the first place. A) Your stomach: Your stomach is full of DNA degrading enzymes and has a high acidity that inherently breaks down DNA of things you eat. Hence, complete gene sequences are not likely to survive this environment. There are also very native gut bacteria in this setting due to the harsh conditions. B) Transfection is relatively uncommon among species of bacteria, and even among those that can uptake foreign DNA, is at a very low frequency. It may surprise you to learn that even in lab conditions, the uptake of genes is quite inefficient, even in highly competent cells like E. coli. In order to successfully grow colonies that permanently express a gene, the colonies are usually grown in a medium that prevents untransformed bacteria from growing. If this is not present, you will get virtually no transformed organisms. This is because if there is no advantage to making a new protein, having that trait is just a waste of energy, and those organisms are less fit to survive in the environment than the untransformed ones. In summary, in order for one single bacteria of your gut flora to be transformed, that DNA would have to survive degradation by enzymes and some how make it to your large intestine and have a competent bacteria uptake it, of which an estimated 1% of species can do at detectable levels, which is could be a possibility. However, the specific gene coding for the toxin, would have to be perfectly inserted into the bacteria, in a very specific orientation, with no pieces missing, which, given that the size of plant DNA can be even larger than humans, is almost impossible. Even if this did manage to happen, it would only be one cell, and it would be at a disadvantage to others bacteria due to this new protein production. Even if it flourished, it would be producing a Bt toxin, which has been extensively studied for over two decades, to ensure that there were no dangers if consumed by humans. Nevertheless, people have still researched the possibility of this occurring despite the low probability of it actually happening because it is our obligation as scientists to minimize overlooking other factors. I am open to speaking about it with you further if you are interested or want some more specific research papers to read.